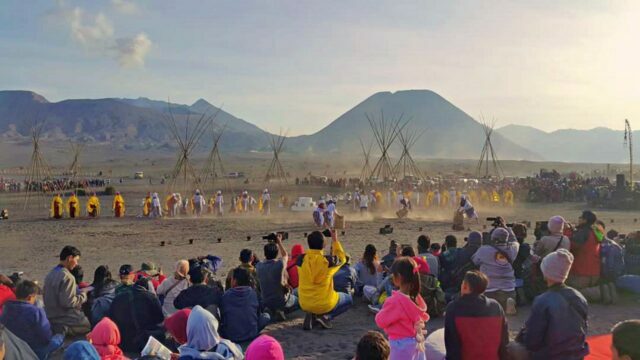 Yadnya Kasada Bromo is a ceremony performed by Tengger ethnic tribe of Mount Bromo. 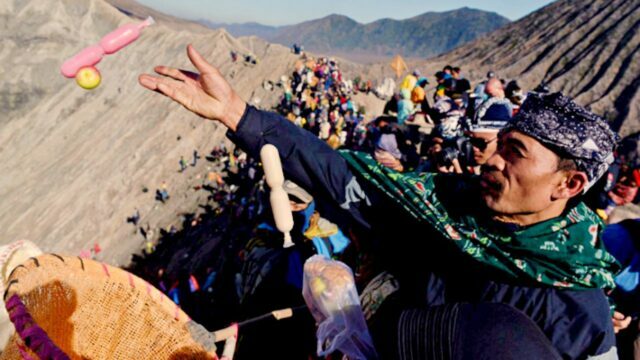 It's an annual ceremony where offerings are thrown into the crater of Bromo. Yadnya Kasada Bromo is one of a highly anticipated ceremony. The procession always attracts a lot of curious tourists every year. Since 2017, the ritual is not only about the ceremony. It has then become a cultural festival. Yadnya Kasada Bromo Eksotika, it becomes a cross-cultural event. Aside from Kasada ritual, Tengger community consolidate other cultural elements from all over Indonesia. And by doing so, they hope it will attract more tourists to Bromo. The first event was a successful one. The lineup is dozens of artists and performers from Bromo and other regions. Not only traditional performance, but contemporary ones also there in the lineup. Don't miss performance like Ponorogo's Reog and Jaranan dance. Traditional defense art and poetry readings are also something worth to watch. No stage exists at Bromo Eksotika. The dancers and other performers will dance with their barefoot. While the audience stands or sits on the sand. Mount Bromo, Semeru and Mount Batok join as the imposing background. This set is in line with Bromo Eksotika philosophy. That is "Side by side with nature, appreciation of life, appreciation for nature that sustains it". 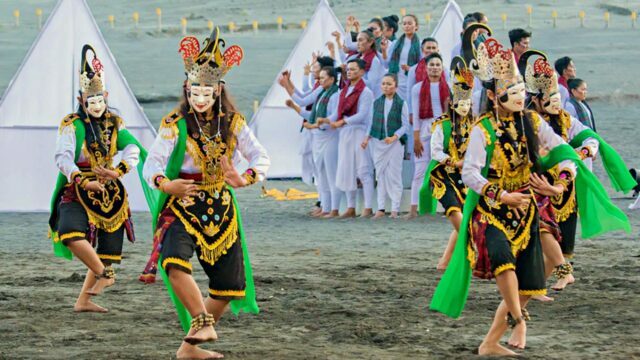 Tengger people as the host will present a colossal opera titled Kidung Tengger. It is based on the legend of Bromo Tengger, the story of Roro Anteng and Joko Seger. Hundreds of performers take part in this elaborate presentation. Scene by scene, they reenact the story of the couple and ancestor of Tengger. It's a story about love and sacrifice. Watch as the dancers tell the perils the couple had to face just to be together. The story doesn't stop when Roro Anteng and Joko Seger finally united. Gods also ask the couple to sacrifice their youngest son to Mount Bromo's crater. Today's Yadnya Kasada Bromo ritual is based on their sacrifice story. Reog dance from Ponorogo makes a regular attendance at Yadnya Kasada Bromo. Like Kidung Tengger, Reog dance is an old legend story. It's a tale about power and palace intrigue, though, as opposed to a love story. The king Barong is portrayed as a lion with a peacock on his head. The peacock represents his queen. Who according to the dance, controls the king and often influences his decisions. Reog dance is intriguing to watch. There are 20-30 dancers involved in this performance. It's amazing how the dancer can move around. Especiits with it's heavy lion headgear and peacock feathers on his head. Many people believe the dancer has a magical strength. No human is able to carry such a costume, let alone dance with it. 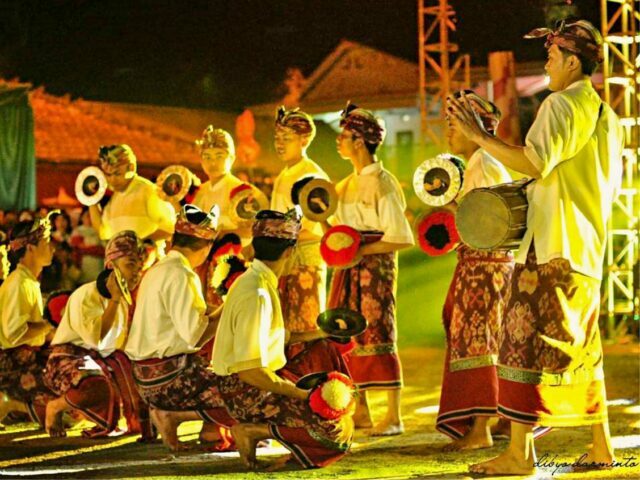 Neighboring towns Lumajang and Probolinggo will each presents Jaranan Dance and Bale Ganjut Musical performance. From outside Java don't miss the performance of Borneo's Dayak people. They will perform an enthralling war dance called Topeng Hudoq. Celebrities from Jakarta takes part in emotional poetry reading. On this open area surrounded by nature, experience heritage of Indonesia in one place. The ritual Yadnya Kasada Bromo will begin at midnight. The ceremony starts from Luhur Poten Temple at the foot of Mount Bromo. Join in the crowd of onlookers as locals parade the offering across the sea of sand. Along with the chanting of prayer and music, the ceremony will then begin. When the party reaches the top, the throwing begins. It's a common knowledge that Bromo is an active volcano. It's eruption and coughing happen quite often. But Tengger people believe that the volcanic activity is a form of Gods' wrath. And their offerings will calm the raging mountains. Locals will put a quite large amount of their agriculture products and livestock. Do not be sad watching living chickens or goats thrown into the crater. Another group of locals is stationed below the throwing platform. Their job is to catch these chickens and goats so nothing goes to waste. This year, Yadnya Kasada Bromo will be held on 13-17 July 2019. The event venue location is at Kasiah Sea of Sand. Right at the foot of Mount Bromo. It's free to attend the event. 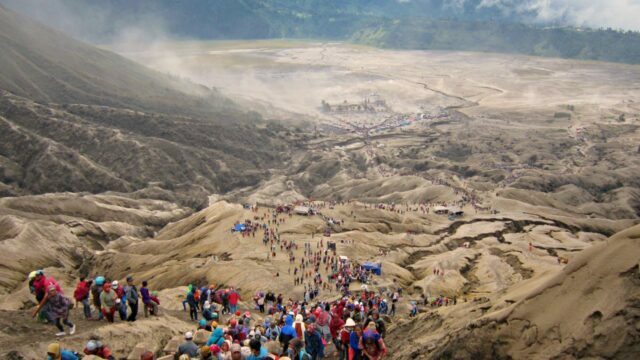 However, tourists will still need to pay the entrance fee of Bromo National Park. The entrance fee will cost IDR 210,000 per visitor for weekday and IDR 310,000 on the weekend. Nearby: 200 meters tall Madakaripura Waterfall, Tips & Guide. The event will be held in an open area with minimal shade. So bring a hat and a sunblock. Toilets and rubbish bins are available at the venue. As for accommodation, visitors can find a decent room at villages nearby. There is plenty of room available in Ngadisari, Cemoro Lawang, and Wonokerto village. The price varies depending on facilities. A decent room will costs IDR 250k a night. Most tourists fly to Surabaya. And proceed to Bromo with a land transfer. There are two options. It's either goes to Bromo via the city of Probolinggo or Malang. If taking Probolinggo route. Take a Surabaya-Jember or Surabaya-Banyuwangi bus from Purabaya Bus Station. Stop at Probolinggo and continue with angkot to Ngadisari Village at Bromo. Departing from Malang, tourists usually join a full tour package. The price starts from IDR 400k/person. The price includes transport to cross the sea sand. Taking the Malang route will expose tourists to a scenic view all the way to Bromo. And both Malang and Probolinggo route require a 2-3 hours journey.